Minister for Children and Youth Affairs Katherine Zappone has told the Circuit Criminal Court she was "deeply concerned and frightened for the safety" of former tánaiste Joan Burton during a water charges protest in Tallaght in 2014. However, it was put to her that she previously refused to condemn the protesters during a pre-election television debate. She was giving evidence in the trial of Solidarity TD Paul Murphy and six other men who are charged with falsely imprisoning Ms Burton and her assistant during a water charges protest in November 2014. 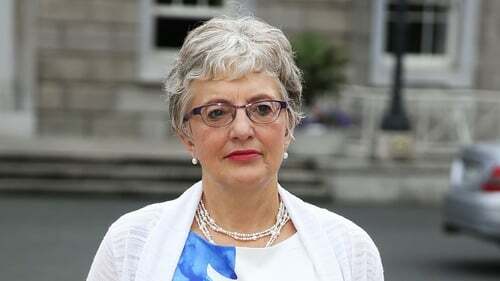 Ms Zappone, who was an independent Senator at the time, said she dialled 999 twice as she felt deeply concerned for the safety of the then-tánaiste after protesters surrounded her car as she left a graduation ceremony in Jobstown. She saw protesters banging on the car and jostling it and eventually Ms Burton and her assistant were moved to another car. She said she walked with the second car for a time because she was deeply concerned about Ms Burton's safety. During cross-examination she agreed that what happened at Jobstown went beyond peaceful protest by some but not all of the demonstrators. She agreed she had no criticism of those who protested peacefully and agreed that a sit-down protest was a peaceful protest. Asked if she had publicly refused to condemn the demonstrators she said: "I think I did say there were menacing elements of the protest that went beyond what I consider to be a legitimate form of peaceful protest." However, defence counsel Sean Guerin played an excerpt from a pre-election television debate in which Ms Zappone was accused by an audience member and one of the protesters of "condemning us". In reply the then-senator said "I do not condemn at all what was going on in Jobstown that day". However, in the witness box today she did not agree with Mr Guerin that this was a public refusal to condemn the protesters. She said her answer in the TV debate was more nuanced and she believed she was being asked if she condemned the women she had worked with in the community. "My judgement is that what happened to Ms Burton was menacing and deeply concerning and intimidating," she said. Asked why she did not share that with voters in advance of the election, she said she had issued a public statement after the event which said the same thing. Mr Guerin suggested that "when in the presence of voters and on TV you won't condemn it, but will quietly issue a statement taking a more subtle view". Ms Zappone also agreed that she had spoken out against water charges in 2014 and agreed that she had given speeches in the Seanad saying people were tired of austerity, were angry and were protesting in their thousands. Mr Guerin read from her Budget statement in the Seanad in October 2014 during which she described "a disconnect between the self-congratulatory discourse in this chamber and the anger and disillusionment resounding in the streets". Mr Guerin asked if she understood protest was a legitimate response when people are angry and disillusioned, when as she had described, the possibility of a good life had been knocked back. She did not agree that the gay rights movement had its origins in riot. She accepted that riots in New York were part of the origins but said that characterisation was incomplete. During cross-examination by Michael O'Higgins Ms Zappone agreed she had emphatically said she had not personally invited Ms Burton to speak at the event that day. However, she also agreed she was now saying that after the invitation was issued by others at An Cosain education centre she may have written a note "encouraging" Ms Burton to attend. Mr O'Higgins asked if "that is the way it is in politics, that you give answers that are palatable and not those that are accurate?" Ms Zappone replied: "Not for me".